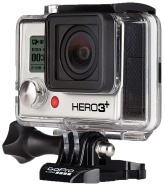 alaTest has collected and analyzed 5053 reviews of GoPro Hero3+ Black Edition. The average rating for this product is 4.4/5, compared to an average rating of 4.1/5 for other Camcorders for all reviews. Reviewers are impressed by the battery and portability. The image quality and price are also appreciated. There are some critical views about the zoom and viewfinder, while there are some mixed opinions about the reliability. Smaller waterproof casing, with buttons that are easier to press. More mounting options than ever. Improved auto white balance, with the option to adjust it yourself. Fast Wi-Fi. Improved sound recording. 4K recording is only at 15p. Waterproof casing latch can be hard to open. Though the updates might seem minor on paper, the GoPro Hero3+ is most definitely more than the sum of its parts, proving that it's still the king of action cameras. Don't buy this! Doesn't work without signing in. Dumbest Company In The World!